I’ve said it many times on CR, but I’ve been a fan of the Gotrek & Felix series since the early-1990s. In Slayer, David Guymer, the fourth author to work on the series, brings everything to a close. Tied in with the End Times, it’s a fantastic, even moving farewell. After I turned the final page, I felt genuinely sad and just a little bit lost for what to do now… Despite one niggle, this is an excellent finale. 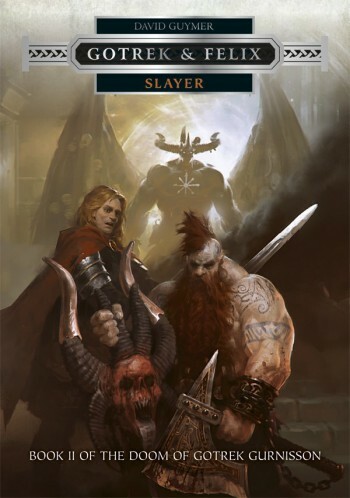 First, a little bit about the series: Created by William King, the adventures of dwarf slayer Gotrek and his human rememberer Felix grew from rulebook mini-tales, to short stories (collected in Trollslayer), and then 16 full novels. 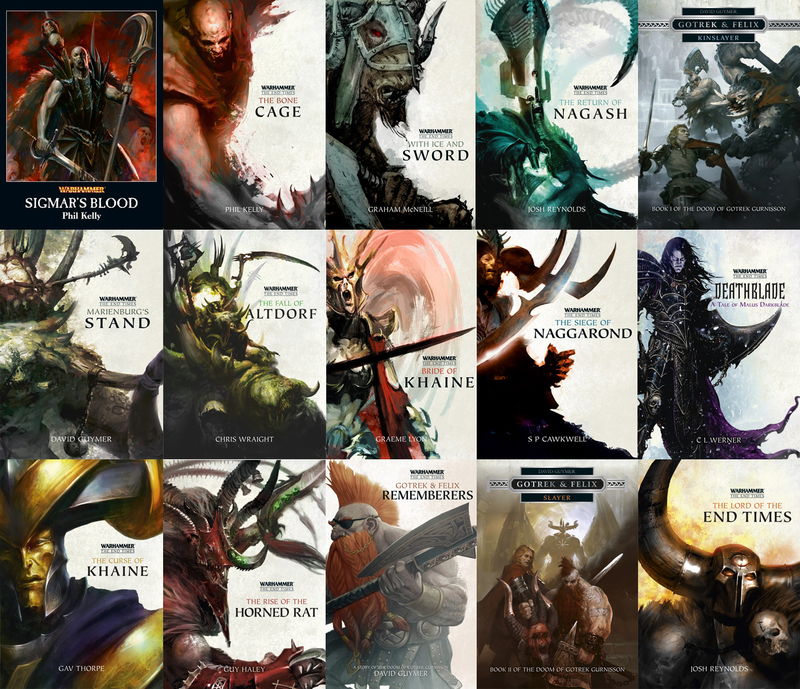 It’s Black Library’s longest-running fantasy series, and I’ve read all but three of the novels (which were set out-of-chronology). After King, Nathan Long took over the series with Orcslayer, and also wrote the spin-off Ulrika novels (which were excellent). Then, Joshua Reynolds and David Guymer took over for the final stretch. Guymer’s Kinslayer, the first in this two-book arc, was a little slow but ended on an excellent, tragic moment. Slayer picks up right away, and follows our heroes on their final journey. From the first pages, it was clear that Guymer has pulled out all the stops — where Kinslayer took too long to get going, here we’re thrown right into the action and the story never really lets up. Guymer brings in many familiar faces, new and old. Not all of their fates are clear. Their returns are welcome, and we continue to see how Gotrek and Felix’s strained relationship develops, struggling with Gotrek’s actions at the end of the previous novel, Felix’s guilt over same and also the abandonment of his wife and child in now-destroyed Altdorf. Gotrek’s mood has shifted somewhat: he’s still angry at everyone and everything, but now he’s determined to return Felix to his family, only to discover the fate of Altdorf at the hands of the Chaos hordes. Events move fast, building towards a tragic end that I hadn’t predicted. It was surprising in many ways, not just because of the events that tied in to the End Times, but also the actual fates of both Felix and Gotrek. If I read it correctly, it was something of a switch-up, which… I can’t write about due to spoilers. Damn it. Needless to say, I thought it was brilliant and appropriately tragic. This brings us to the one weakness of the novel, and that is Malakai Makaisson. As a character, he’s great, and I enjoyed his presence in previous novels. But, and I don’t know if this is me misremembering or not, but it felt like his accent was even more exaggerated than normal. He’s a dwarf who speaks in a faux-Scottish accent, and it sometimes felt like 90% of the words were accented, which was distracting and just a little annoying. Regardless, he’s a fun character, somewhat mad and contributes in interesting ways to this novel and the series as a whole. A fitting end for our heroes — two of my favourite fantasy series in any series or book. Gummier writes the characters very well, bringing them to life on the page. He keeps up the pace of the story and maintains the momentum throughout. Thank you, sir, for giving these two such a great send-off. They will be sorely missed. A must-read for fans of the series and characters. Very highly recommended.